Preferred long-term storage conditions cool and dry environment. Cyclic loading occurred at > 5000 cycles of 250% strain. This test yielded results that were similar between the pre-stretched trial and after 5000 stretches (at 250% strain). This testing is well beyond what is needed for the SWAT-T to function as a tourniquet. The SWAT-T has been tested to 300 degrees Fahrenheit and frozen for weeks. The SWAT-T has been brought to 212 degrees (in boiling water) and allowed to cool to room temperature. Heat and cold tested devices performed well immediately after removal from their respective environments. ***While durable and multi-purpose, the SWAT-T is still a medical device and should be treated as such. Damaged or soiled devices should be discarded (bio-hazard if soiled). Training should be accomplished with a device dedicated for training. The SWAT-T is perfect for situations where having a full size Combat Application Tournequet is just not practical. The SWAT-T allows you to always have a tourniquet device available on your person because in its package it is smaller than most men’s wallets. It’s easy to apply on another person and your own lower extremities, but takes some practice to apply it to your own upper extremities but it can be done. Always good to have multi-use items. I keep one of these in all my kits because of it's versatility. This is NOT an easy device to use if you don't have the use of two hands, so I wouldn't consider it a good personal choice. Also, haven't had to use it as a tourniquet yet - thank goodness, but it has worked well as an ankle and knee wrap. It is fairly easy to use but slightly slow to apply to your self, It is straight forward to use with instructions printed on the side of it. It is versatile and cost effective. Carrying one of these is so easy. They are compact. 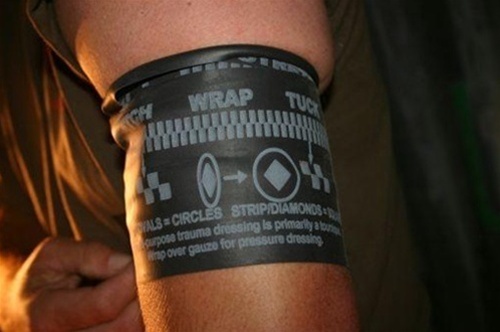 Use it as a tourniquet or pair it with some H&H Primed gauze and you get a super compact pressure bandage too. Take it out of the package and wrap it around a few supplies to make a compact kit out of it. These are cheap enough and compact enough to throw some in every car, in a bag you carry regularly and a desk at work. They may not be the most effective tourniquet or the perfect pressure bandage, but they cover lots of aspects in a small, inexpensive package so you have them when you need them. Watched the demo/training videos in preparation, though I hope to never need to use this. I like that these are compact, durable, and can be used to dress a wound/bandage or as a tourniquet. Easy for lay person to use. Marking define pressure dressing vs when applied as tourniquet. I got these for the size and ease of carrying. I carry one with me at all time to replace the CAT that I used to carry. The others are in my First Responder Bags. I haven't had a chance to use one yet.